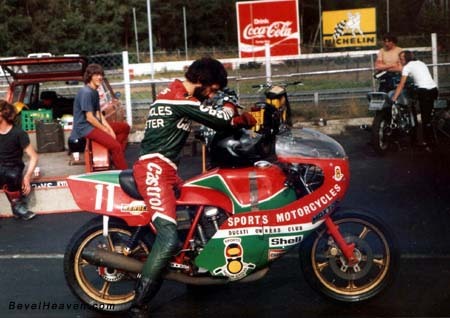 Here is Steve Wynne in 1981 on the Clubrace of the Dutch Ducati Club (3rd edition) in Zolder Belgium. At that time he was racing himself later years he came with his own riders (i.e. Roger Burnett). The bike is a BeavelHead NCR Ducati which was said at that time to be Mike's (Hailwood) bike which won the Isle Of Man race. I'm not 100% sure though. A couple of years later Steve got cancer and when he came back to the Clubrace he really was entirely bold (look at his 80-s hair). The clubraces in Holland have a long tradition of getting exiting bikes to the event. This bike and the man who build it was the first one in the row. Promotion of the event was that this was THE BIKE. My not being 100% sure is more about the fact that racers even after doing legendary things get ripped for next years bike. It all started once on a cold Friday in October 1979 and now turned into the third motorcycle racing event in Holland after the Dutch TT Grand Prix and the Superbike round. In those early years it was a BevelHead only event, now the event is far too big and I wont find the athmopherics from the old days (ha, ha, I'm doing like an old man). Now the there are some things happening within the Club to see if the BevelHeads can more active again. Steve Wynne is the builder of the real Hailwood race bike & lives in Manchester. Website created by & © FEzone.com 1998-01, All Rights Reserved.